In the second novel of Maya Rodale’s enchanting Keeping Up with the Cavendishes series, an American heiress finds her reputation—and heart—in danger when she travels to London and meets a wickedly tempting rake. 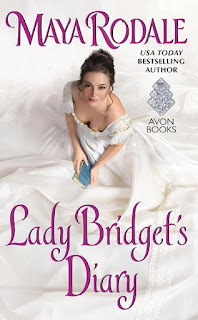 Lady Amelia is fed up with being a proper lady and wishes to explore London, so one night she escapes…and finds herself in the company of one Alistair Finlay-Jones. He’s been ordered by his uncle to wed one of the American girls. How lucky then, that one of them stumbles right into his arms! When Amelia finds out Alistair has been ordered to marry her, he must woo her and win back the angry American girl. But with the threat of scandals, plural, looming…will he ever catch up to the woman he loves? “Do shut up, Amelia,” Bridget said through gritted teeth. Unlike the other Cavendish siblings, Bridget actually cared about fitting in here. She was obsessed with learning and following the rules. 4 an American Independent Streak Stars. Chasing Lady Amelia is the second book in the Keeping up with the Cavendishes series. I find Maya Rodale's writing style to flow rapidly, the characters to be engaging, the storyline to be only slightly over-the-top, and the humor to be more witty than forced. All of which makes me a happy reader. As an American, Amelia has certain inalienable rights, such as the barbaric notion of freedom, or not being a man's property. With her brother inheriting a dukedom, an overbearing aunt, and every night filled with boring balls, endless rules, and vapid humans, Amelia has had enough. No doubt Amelia will rub many a reader wrong, but I enjoyed her. I understood her. I remember how I felt at her age. I remember the reasons I refused to take my ex-husband's surname, informing him how he wasn't adopting a grown woman during our marriage ceremony. Yes, Amelia had a bit of a feminist bent, which to this day leaves a bad taste in many a mouth for some odd reason. Amelia throws a fit, screaming her grievances to her family. What do those rules do for 'civilized' society, when they act horrific in all the ways that count? Finding her mad, they drug her with laudanum in her water glass at bedtime...so clearly the events of the next 24-hours are their fault. Clearly. Alistair finds an inebriated, young woman wandering, and doesn't know where she came from. So, clearly, the only proper thing to do is take her home with him, right? While she rests, he has a meeting with his uncle, where he is told to marry one of the Americans...his lucky day, since he has one sleeping in his home. After months of being in England, never checking out the sights, because it was more important to be taught how to snag a man, as if the only worth of a woman is the man who has possession of her, Amelia uses her time away for freedom. I'm positive this will also rub many a reader wrong. Shrugs. Amelia, you go be Amy Dish and live a little, instead of being miserable over rules that have no bearing on being a good human being. As you can see, I'm of the feminist bent – yes, I find it highly ironic that historical romance is one of my favorite guilty pleasures. Seeing how the other half lives, I suppose. Amy and Alistair had a ton of chemistry, witty banter, and hilarity during their adventures. As the reader, not only could I buy into their romance, I could feel it too. Chasing Lady Amelia was an adventurous tale, featuring a spoiled, slightly immature, yet completely in her right, American who wanted her freedom back, an over-the-top family, and a man who will accept Amelia for the special snowflake that she truly is. Follow the Chasing Lady Amelia Blog Tour HERE. 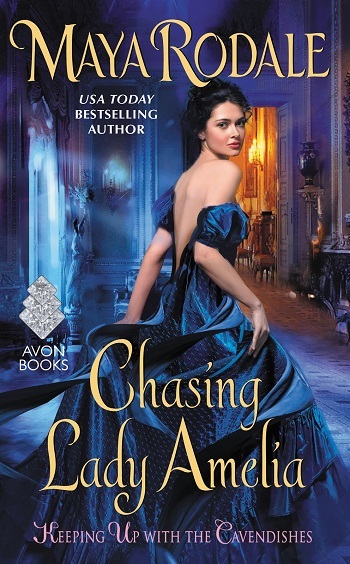 Reviewers on the Wicked Reads Review Team were provided a free copy of Chasing Lady Amelia (Keeping Up with the Cavendishes #2) by Maya Rodale to read and review for this tour.